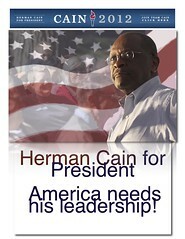 Herman Cain sent me a letter requesting campaign contributions and he listed the usual reasons for supporting him. He also listed two reasons to support that are unique to his campaign. He is descended from slaves and Barack is not. He also claims that he is an American, not an African-American. However, the GOP needs him on the ticket because he is Black. In this he implies that he would take the second slot on the ticket if he is not the presidential nominee. I sent him no money.